Welcome to Minako and Chikako from Japan! 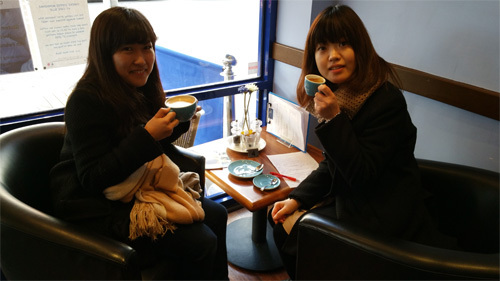 Minako from Osaka and Chikako from Kyoto did not know one another before coming to Purley. Here they are enjoying a coffee in Purley's coffee shop ‘Cafe Blue’. A brief pause before going back out into the streets to continue their research into English shopping habits and attitudes. Minako and Chikako are our only Japanese students at the moment so welcome to them! May they make many international friends at our language school.